I find the notion of a ‘super cup’ to be a strange fixture in any league; the top team taking on whoever manages to win the cup. 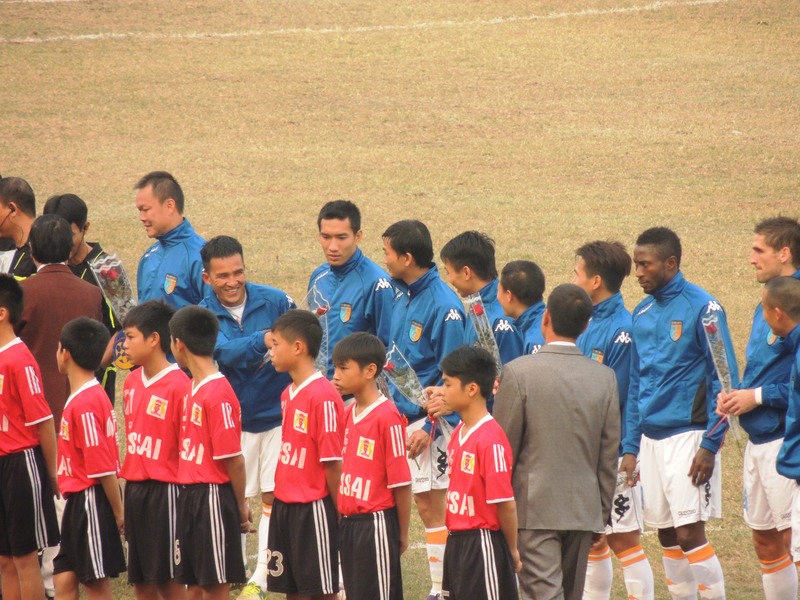 Here in Vietnam that equates to Hà Nội T&T , league winners having been the best team over a 20 match season (minus the 2 against defunct XT Saigon) taking on Vissai Ninh Bình, who secure the cup after playing just 4 matches (two of which were won on penalties, including the final). In England the Charity Shield also throws up similarities; league winners Manchester United, played 38 games compared to cup winners, Wigan Athletic, who played 7 matches (including a reply at Bournemouth). The English Premiership may be light-years away from the Vleague but I found myself comparing the two fixtures. Hà Nội T&T, like Fergieless Manchester United, had lost an influential figure from their title winner team, their club Captain; Cristiano. Ninh Bình, had it not been for the demise of XT Saigon, would have found themselves relegated, just like English FA Cup winners Wigan Athletic. Alas, it’s a fixture football authorities worldwide favour and gives teams a final semi-competitive game before the season kicks off for real. The tie also gives fans a chance to see players recruited for the new season. Hà Nội T&T welcomed Croatian Gruica into central defence while Australian defender, Sam Gallagher, watched on from the stands. New central midfielder, Hector, previously with SLNA, was also on the sidelines. We travelled down by train, some 100km south of Hà Nội to Ninh Bình province. The province is home to some dramatic scenery as the huge karsts formations rise up from the rice paddies below. The perfect spot to explore for a weekend. Feeling somewhat of an experienced away football traveler in Vietnam, which in theory should mean I no longer get lost for hours finding my way to provincial stadiums, I knew there was just one café located near the stadium! With no tickets visibly for sale, we were loitering around when called over to join the T&T subs for their pre-match coffee. 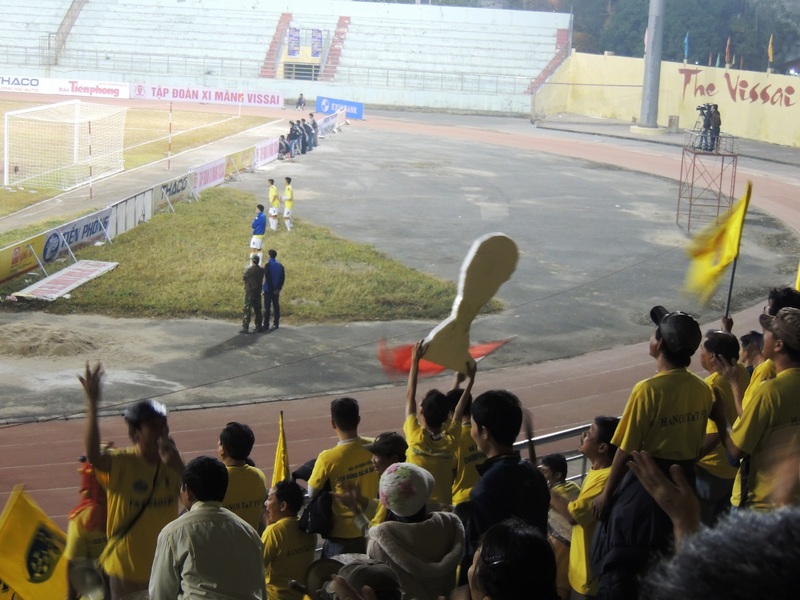 The players eventually dispersed as three coach loads of Ha Noi fans, quite possibly paid for by the owner, arrived at the stadium. True to form, we tagged along and went inside without a police check or a ticket. The large crowd inside suggested it was a ticketless event. The game was certainly more than semi-competitive, with hard tackles flying in and an eagerness shown by both sides, especially Ninh Bình whom attacked from the off. After a disjointed performance from Hà Nội T&T, on a terrible pitch that resembled a bad day in Wigan, the final score ended 2-2, with Ninh Binh twice taking the lead through Tran Manh Dung (23’) and Le Van Duyet (73’) only to be pegged back by goals from Bui Van Hieu (31’) & Samson (79’). Hong Son earlier saved a penalty for Hà Nội after new signing Gruica was harshly adjudged to have handled inside the area. The games moved straight on to penalties. 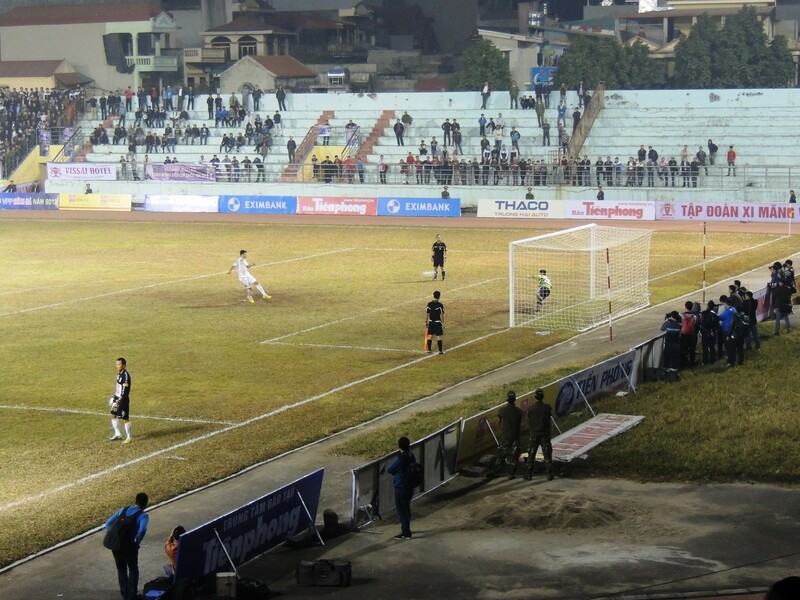 Hà Nội raced in to a 2-0 lead as Ninh Bình hit the woodwork with their first two attempts, silencing the raucous home crowd. It didn’t last though. 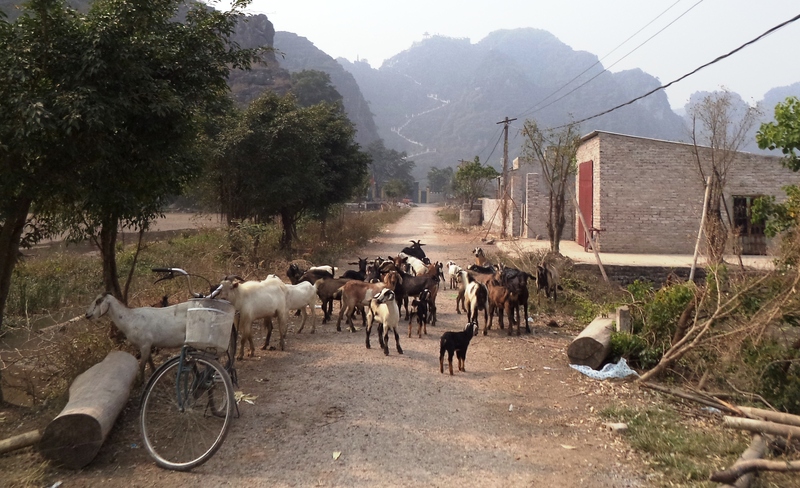 Ninh Binh hit back as T&T cracked. The home side ran out eventual 5-4 winners, to the delight of the home fans and huge number of playing/coaching staff that invaded the pitch at the end. Once again, a joyous home fan decided to part with his flip flop and send it the way of the T&T bench as some kind of consolation prize. I’m still bewildered by how many fans over the course of a season will walk home with just one flip flop on. It stops there for me, as moments after the last kick was taken the local police ushered us straight out of the stadium, allowing no time to see the presentation or even applaud the players. Le Van Duyet (73’) Samson (79’). Attn. Unknown, quite a lot. 7,000-10,000?